Should you buy or rent custom doormats? 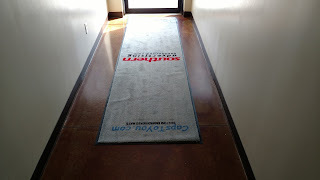 Many companies rent commercial logo mats from rental uniform companies such as Cintas, Aramark and many others. 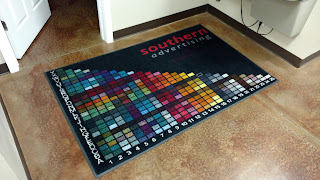 The sister product a solid color entrance mat is also rented on a weekly or biweekly basis. I will attempt to convince you that this is a huge waste of money and the majority of companies do not need to rent. 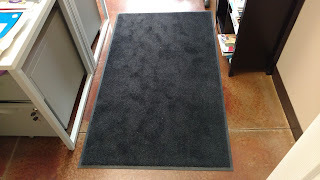 Here are the details of renting custom doormats or solid mats. When you enter into a contract with rental companies they make you sign a very long usually 36 to 60 month agreement. What this means is that you will use the rental service for this amount of time OR they will sue you for any remaining balance if you leave early. Obviously not good! Doing the math for renting doormats works like this, depending on the size of the mat let say 4x6 foot solid mat for this example rents for $8 a week. So doing the math that is 8 x 52 weeks for a grand total $416 a year. Over 3 years that is $1248 over that timeframe wow! Lots of mula and you do not own the mat at the end. These mats will last 5 to 10 years easy. All you get for this is a service and the rental company will pick up the dirty mat and drop off a clean one. That's it nothing more. Adding your logo to the mat and they will charge higher weekly rates. You can purchase a solid color 4x6 foot mat for $92. OK, SO $92 vs $1248 is a huge difference in cost. OK, one area that does add some cost on the purchase side is cleaning the mat. Depending on how much traffic max is once a week and most of the time bi-weekly or monthly is all that is needed and a good vacuuming is all it needs. Most cleaning services do this anyway. And in some cases having a rental service is the right solution but very few times.